A very successful 27th Ride for Sight was held on Sunday February 15th and for this we need to thank Dis-Chem Pharmacies, our naming sponsor, the City of Ekurhuleni our generous hosts, the secondary sponsors of prizes and services, our co-organizers Springs Wheelers, Hamnet, Benoni Red Cross and the hundreds of volunteers who assist on the day. Special mention must be made of our volunteer organizing committee many of whom have been with us since the inception of the ride in 1989. The entire proceeds from the event go directly to supporting the patients services project at the University of Cape Town and over the last 27 years has generated more than R5m to help find treatments for retinal genetic blindness. The annual OSSA congress was held in Durban from 12th to 14th March 2015 at the ICC in Durban. An awareness table and delegates fees were kindly sponsored by Rhyno Kriek, conference organizer. We gave a presentation on Genetic research and testing in South Africa to the Optometric and Ophthalmic Assistants program. Interest in our awareness material was gratifying and our stock was totally depleted by the end of the congress. Our annual SMAB meeting was held at the congress and the meeting was co-chaired by Professor Ramesar and Dr Linda Visser. Invited guests were Professors Colin Barnstable and Joyce Tobran- Tink from Penn State University USA. They both gave excellent papers at the congress on genetics, Epigenetics and biological pathways in retinal degeneration. Pictured from left: Professors Trevor Carmichael and Ismail Mayet, Drs Robyn Rautenbach, Aubrey Makgotloe and Susan Williams, Prof Raj Ramesar, Dr Mohamed Motala, Claudette Medefindt [ Retina SA] Professors Colin Barnstable and Joyce Tobran-Tink, Drs Linda Visser and James Rice. Past smokers and smokers developed wet Age Related Macular Degeneration [AMD] almost 4,9 and 7.7 years earlier then never smokers. Genetic mutations in various genes resulted in earlier age of onset ranging from 2,8 to 12.2 years. Published in the JAMA – Ophthalmology February 2015. ANNUAL REPORT ON THE RDD RESEARCH PROJECT AT U.C.T. We have 3 postgraduate students undertaking RDD research projects. This promises to yield some interesting results over the next 3 years. In addition, over and above their projects; Lisa Roberts performed the statistical analysis of the MYO7A founder mutation for Usher Syndrome in 185 Africans. She supervised the initial screening by an NRF intern, Ms. Siddiqah George and then completed the final screening of the remaining samples. Lisa wrote the manuscript which was submitted for publication early in 2015. Stacey Moses and other NRF interns electronically captured all RDD patient data that has arrived at UCT/Human Genetics unaccompanied by samples. All this data has been compiles into a searchable spread-sheet to assist with RDD epidemiological information. 101 samples were received from 51 new families and 50 old families. Of the 101 samples, 50 were saliva samples. 6 Skin biopsies were also received. Five DNA sample were isolated by the NHLS and sent to us for archiving and possible future screening. 13089 database entries were entered onto our database in 2014 and pathogenicity investigation was performed for each variant identified, prior to delivery of the official laboratory report. 3 results were received from Manchester (NGS) from samples sent in 2013. One of the results was verified and confirmed in the family. The other 2 results were not confirmed for various reasons. 7 results were received from Asper Biotech in Estonia: Verification of the all these results from the November 2013 batch was completed. 14 DNA samples were sent for Microarray testing to Estonia in June (5 self-funded + 9 funded by Retina SA). 3 samples were sent for Next Generation Sequencing to Manchester in June. Some results of these are still pending. 1 additional test was performed for family mutation: 1 PCR and 2 Sequencing 8 Quick 7 tests – done by NHLS. 193 families stand to benefit from current gene therapy trials: 5 RPE65; 6 AIPL1, 8 MYO7A; and remarkably: 174 ABCA4. We are assisting in the attempt to bring 2 clinical trials for Stargardt Dystrophy to South Africa. Patients with a diagnosis of STGD or Cone rod dystrophy who are interested in being considered for possible inclusion, if we are successful, should contact Claudette at email:medefindt@intekom.co.za. All RD patients, particularly those under the age of 40 should have a genetic diagnosis- do you? Nightstar has received Orphan drug designation in both Europe and America for the treatment that it is developing for Choroideremia. This gene therapy treatment was originally developed by Professor Robert McLaren and showed good results in an early trial last year. These visual hallucinations are receiving much needed attention. Hallucinations can be geometric shapes or even complex visual details and scenes. 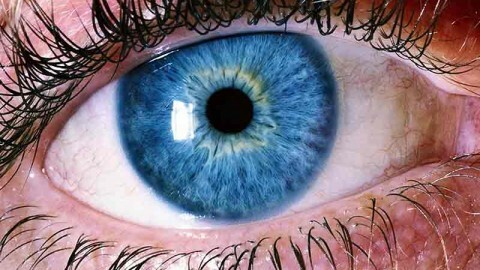 They occur in cases of advanced visual loss and can be very disturbing. It is estimated that more than 10 % of patients see them and they are largely underreported. To see Dr Oliver Sachs interesting [ but with somewhat controversial theories] TED presentation click on the link http://www.ted.com/talks/view/lang/en//id/637. In a study published in the November issue of Investigative Ophthalmology & Visual Science, researchers derived a formula that predicts, with high accuracy, whether a patient with mild or intermediate AMD will progress to the wet stage. By adding a computerized image- processing step that analyses data from SD-OCT scans ophthalmologists will be able to predict a patient’s likelihood of progressing to the wet stage within 1 year, 3 years or 5 years. Lisa Roberts conducts research on eye diseases, including rare genetic diseases that run through southern African families. 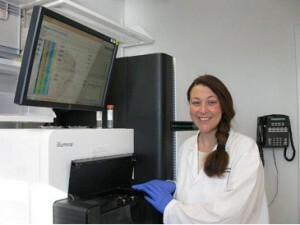 She spent November in the NEI Neurobiology Neurodegeneration & Repair Laboratory (NNRL) learning techniques that she’ll apply in her genetic research at home. 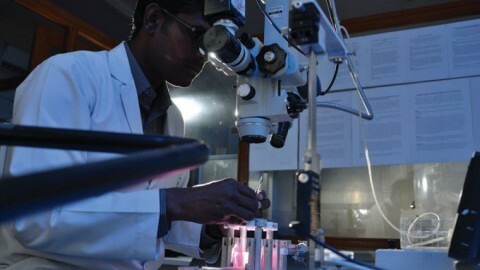 The ultimate goal of the Retinal Degenerative Disease (RDD) project is to identify the molecular mechanisms of diseases causing vision loss in South Africans. The project has a strong emphasis on translational research, which means that many of its findings are translated back to patients. 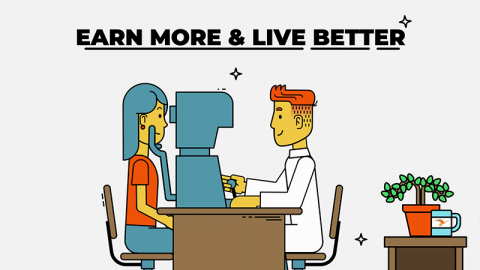 For example, when a genetic mutation causing vision loss is identified in a family, the family is offered diagnostic testing, including carrier testing and predictive testing. This enables life planning and reproductive options, and is essential for participation in any gene-based therapy trials. 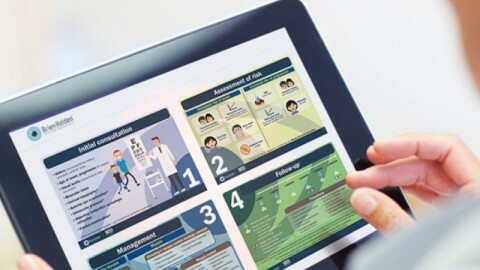 She and her colleagues on this project have strong relationships with the patient-driven action group, Retina South Africa, and they regularly provide research feedback to patients by hosting several awareness days each year and contributing to Retina South Africa’s e-newsletter. Ms. Roberts came to NNRL in collaboration with Dr. Anand Swaroop, chief of the NNRL, to perform Whole Exome Sequencing analysis on 56 individuals from 16 indigenous black African families with different retinal diseases using NNRL’s Illumina HiSeq DNA sequencer. In addition to performing this specific research project, she wanted to master the skills to use this cutting-edge technology. The sequencer is not yet widely available in South Africa, and her new skills would build capacity for genomic research there. Their next step is analyzing the vast amounts of sequencing data they have generated. 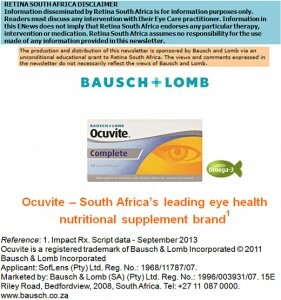 The results obtained from this research will be applied to hundreds of indigenous black South Africans suffering from vision loss. 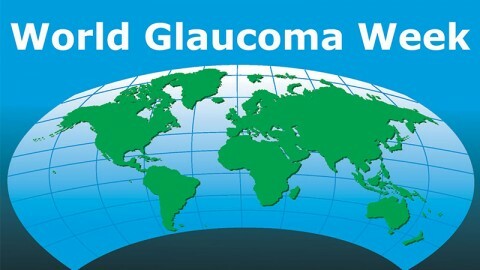 In addition, Ms. Roberts hopes the results of this project will inspire other investigations into retinal diseases for the people of broader Southern Africa. Click on the icon at the top of our website, www.retinasa.org.za and keep in touch with all the latest research into retinal vision loss. our face book and page are ably administrated by carlo amorim- proud father of a new baby boy – congrats ana and carlo. 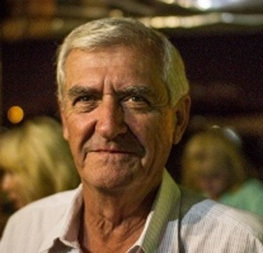 BOB Bristol was one of the founder members of the Gauteng branch of Retina South Africa and over the last 35 years was a dedicated and loyal supporter of the work of the Foundation. He served as both Chairman and vice -chairman of the branch over the years and could always be counted on when help was needed. Bob died of a short illness on February 18th. Condolences to the family. RIP. 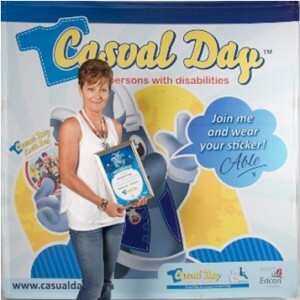 Both the Gauteng and Northern Gauteng branches of Retina South Africa achieved record sales of casual day stickers in 2014. Sharon Morrison pictured on the right achieved 10th position in Gauteng. She sold an amazing R101 505,00 making a profit of R40,602,00 for our Gauteng Branch. She does this single handedly and at her own expense. She is a true volunteer. 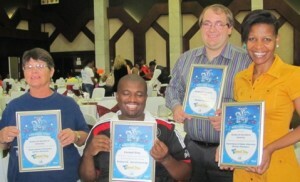 Northern Gauteng’s Casual Day Stars who were also acknowledged at the Show and Tell breakfast, helped to raise more than R40 000 for the North Gauteng branch. From left to right Annette Boshoff, Papama Cweba (standing in for Siphwe Ramaela), Hannes Verster and Mosima Maninjwa. The branch was no.8 on the top achievers for NGOs. Please help us with distribution of Casual Day stickers in 2015 and we can make it to no.1. Contact Thea at 012 546 4715 or emailnortherngauteng@retinasa.org.za. Thank you to all the shoppers who have nominated Retina SA as a beneficiary [and to those who remember to swipe their card] We have raised a total of over R53000 since March 2013 mostly thanks to the recruitment efforts of the North Gauteng branch. This money goes directly to fund the patient services project at UCT. Imagine what we could raise if all of our readers recruited 10 supporters. Simply go to any Woolworths or participating store and fill in a form nominating Retina SA, telephone number 0860595959, as your beneficiary. Your card will be issued and posted to you at our cost. Then start swiping. Visit www.myschool.co.za for a list of participating retail outlets. with clinical trials now a reality we need your help. Thank you to those members who have joined, but to make it profitable we need to recruit more. With your support [and a R240 donation] we will get this project going soon. Our SMS campaign also needs your support so please remember to SMS “Dream” to 38267, sms costs R10. Please forward to your contact list and let’s go viral. These prestigiuos awards are presented to individuals and companies to acknowledge their significant contribution in the quest to find treatments for retinal blindness. At the award ceremony following the Dis-Chem Ride for Sight the following were acknowleged: Arthur and Jean Bowler 27 years support, Mike and Ellen McBeath 26 years support, Mervyn van Reenen 25 years, more than 10 years- Derek Mc Ewan and Margaret Pappas, more than 5 years- Marian Nickless, Rob van Deventer, Alison and Derek Oborn. Incredible Rookie awards – Sharon Morrison, Hamnet and Dark Horse Brands. Gold medals were awarded to Arthur and Jean, Mike and Ellen, Sharon and Derek McEwan. 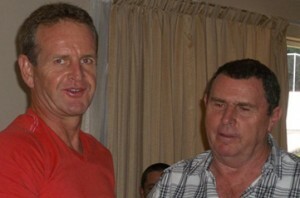 Derek Mc Ewan left with James Cape National Chairman. More than 300 volunteers at the Ride are greeted at 04h30 with coffee and muffins prepared by Marian Nickless and her team. The muffins are baked by students of Claudettes yoga school. None of these ladies have RD in their families but always help very willingly. Thank you. Some of them are pictured here from left Gillian, Di, Ursel. Anne, Mel, Sue and Sue, Val and Lettie. On 21st March 2015 (Human Rights Day) our branch hosted a picnic in the beautiful Hout Bay area. We invited all members and their families and friends to come and spend the afternoon with us and socialize with each other in a relaxed and informal environment. We had a great group of diverse and interesting people from all walks of life. There were young and old people all mingling and sharing their life experiences with each other, and there were lots of kids who were having a great time playing together in the beautiful surroundings. We had two guest speakers, namely; Dr. Janet Hodgson and Jennifer Webster. Janet is the author of several books, some of which deal with her life and experiences of living with AMD. 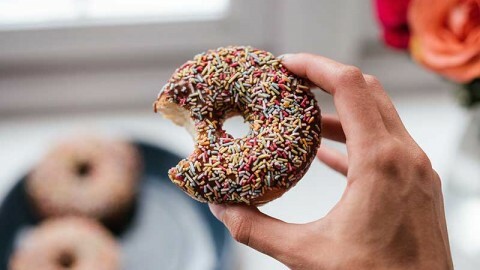 Jennifer is an enthusiastic blogger who has a unique and inspirational way of sharing her life experiences of living with MD. Both these ladies are great inspirations to us all and have a lot to share with the world. We were also lucky enough to have both Georgina Sampson and Vincent Daniels present at the picnic, and as two of the original founders of our organization, we were very glad to have them share their experiences with us. We were also very fortunate to have some of the major role players in the blind and visually impaired sector with us for the afternoon. We then had a lucky draw with some wonderful prizes which were donated by some very special people and organisations who have shown us great support. Everyone was really excited and some great prizes were won. We had some great feedback from all who attended and we missed those who could not attend, and we look forward to a few other great events and get-togethers over the rest of the year.